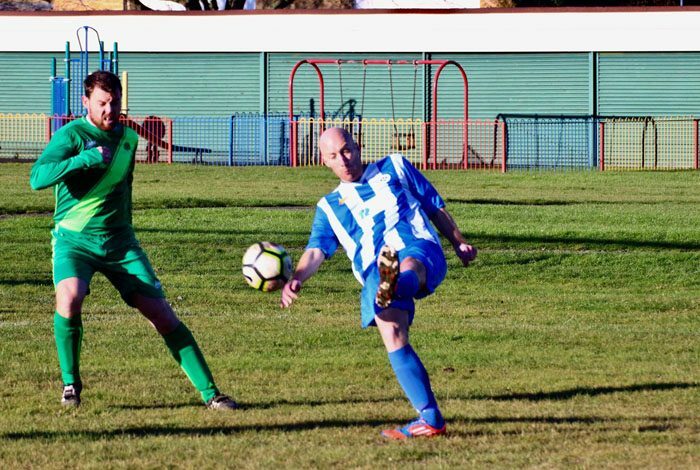 Newton Aycliffe Sports Club continued with their impressive home form making it seven wins from seven and scoring 52 goals in the process. This was the second time that the Sports Club scored 11 goals in one game and have now set their sights on a promotion push. This week’s visitors was Spennymoor Ash Tree, who had taken three points off the hosts in the reverse fixture at the start of the season. However, both sides were playing with depleted squads, but the Sportsys strength in depth proved to be the difference in this encounter. It took only three minutes for the home side to take the lead with David Teders shot deflecting off a defender to make it 1-0. A second quickly followed on six minutes, Ryan Durrs cross finding Ollie Gell to easily slot home. David Teder struck again on 15 minutes to make it three and it was veteran Darren Griffiths looping header that made in 4-0 with only 20 minutes played. David Teder then turned provider, crossing low for Ollie Gell to get his second of the game. Gell secured his hatrick on the 40 minute mark racing through to slot home the sixth goal. Not to be outdone, Teder soon followed with his hatrick with the ball falling at his feet after Gell and the keeper came together in a clumsy challenge. Anthony Campbells deflected effort made it 8-0 as the game went into the break. Ash Tree changed formation and went with five at the back to ensure damage limitation and it worked for the first 15 minutes of the second half. But sloppy defending cost them as David Teder dispossessed the Spennymoor full back and ran through on goal to slot home the ninth of the game. Ryan Durr then missed a complete open goal before home goalkeeper Mark Craggs gifted the away side a goal. Teder got his fifth goal of the game latching onto Anthony Campbells cross and then Adam Gittins rounded the game off with a cross from the corner which floated over the away keepers head to make it 11-1.